Powertech Uranium Corp. has come up against a buzz saw of opposition since word spread in late 2006 that the company wanted to mine uranium in northern Colorado. Since that time, the governing bodies of five municipalities surrounding the proposed project area have passed hard-hitting resolutions urging all federal, state, and county agencies to deny "any and all" permits sought by Powertech. The common denominator in the resolutions is that the proposed mining area is too close to a large and growing population of northern Colorado residents (see map). Powertech's response to these resolutions has been erratic. 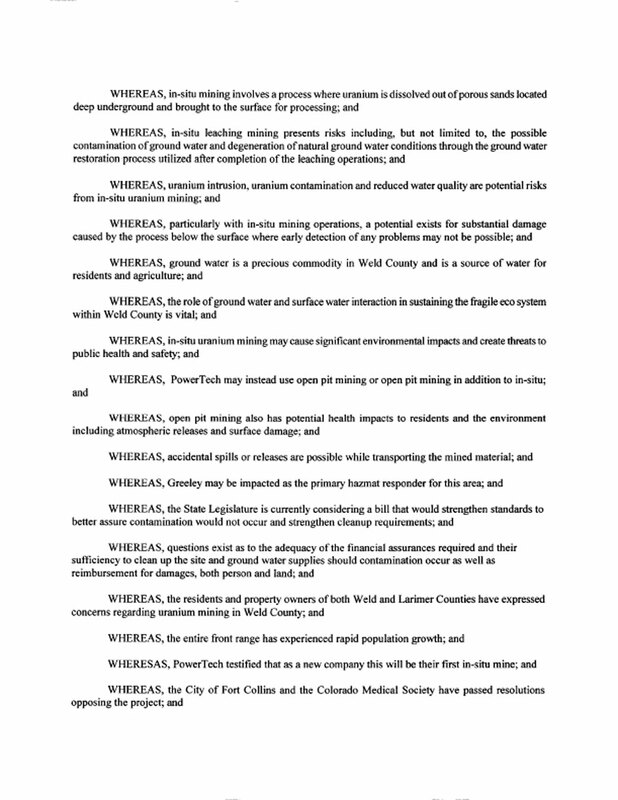 The Fort Collins City Council passed the first resolution and Powertech responded by buying a full-page ad in the Fort Collins Coloradoan to lambast the councilmembers. Subsequent resolutions were met with silence from Powertech. The company did not even bother to send representatives to at least two meetings (Wellington and Ault) where votes were taken on uranium mining resolutions. Information and links to stories and PDF copies of the resolutions are below. 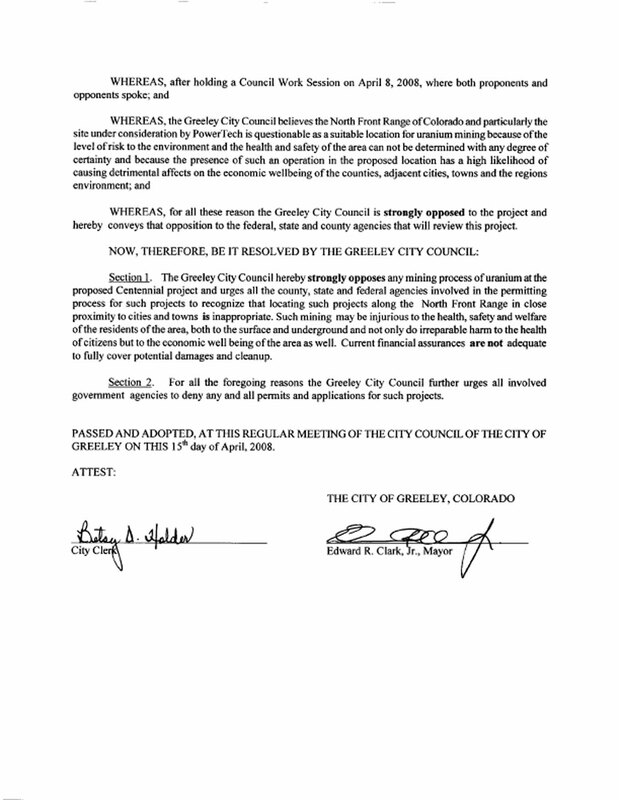 The full text of the Greeley resolution is reprinted below because I have not previously published it. 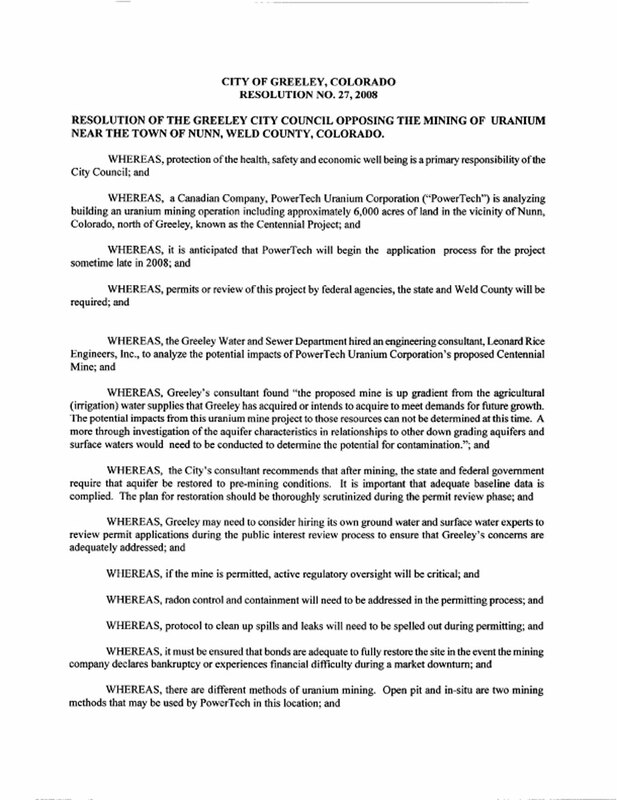 The City of Greeley hired an outside engineering consultant that found "the proposed mine is up gradient from the agricultural (irrigation) water supplies that Greeley has acquired or intends to acquire to meet demands for future growth."